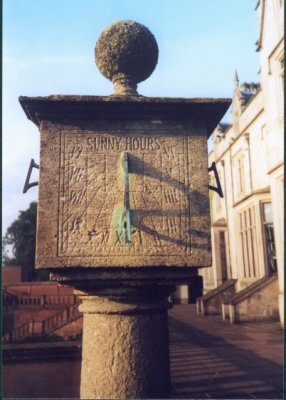 Lilleshall Hall, near to Newport, Shropshire, is the National Sport Centre. It was built in the 1830s by the Marquis of Stafford , who in 1833 become the Duke of Sutherland. It became the National Sports Centre in 1951. You can find out more about Lilleshall at the National Sport Centre website. 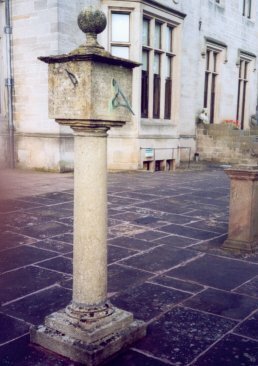 The "pillar" sundial was made at the same as the house. 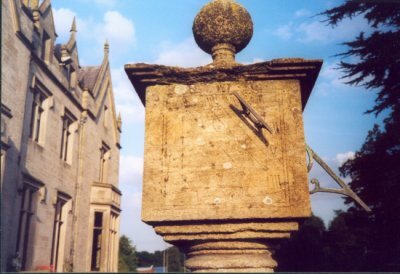 This is the north-facing side with a vertical gnomon and the conventional motto "Sunny Hours"
The West side of the sundial is quite worn by the prevailng wind and difficult to read but in this case the shadow cast by the polar gnomon is pointing at the Roman figure five.